Since Lightning 100 took the initiative to spotlight more local artists, they’ve been a springboard for quite a few artists around town. Two artists that are performing tonight are on the L100 (and No Country) radar. Zeke Duhon was the Lightning 100 artist of the week recently, and we recently premiered a track from Cotton Wine’s self-title record on The 615 when we took over. Tonight offers the opportunity to see both of these up and comers for free (and at a reasonable hour for those of you day job lackeys) when they headline a showcase over at Douglas Corner starting at 6pm. The perfectly matched duo of Brandon James and Femke may hail from outside the United States, but they quickly adapted their pop infused folk sound upon relocating to Nashville. Both are talented singer/songwriters/producers in their own right, including Femke recently receiving a nod for co-writing a Latin Grammy award winning song. After you get to know their music, you will agree, it is clear that this isn’t another flash in the pan duo. Check out their video for the song, “Corn In A Cotton Field,” that we premiered on Lightning 100 last month, and, if you have any sense, you will keep Cotton Wine on your radar. Zeke is another one of those tireless artists in Nashville whose hard work is paying off. People are beginning to take notice of the music of this new Nashville singer/songwriter. His expertly crafted pop songs leave the heart longing for more on a chill pre-winter evening. Refamiliarize yourself with the track that was on steady rotation on Lightning 100 a couple of months ago to get you in the mood for more tonight. 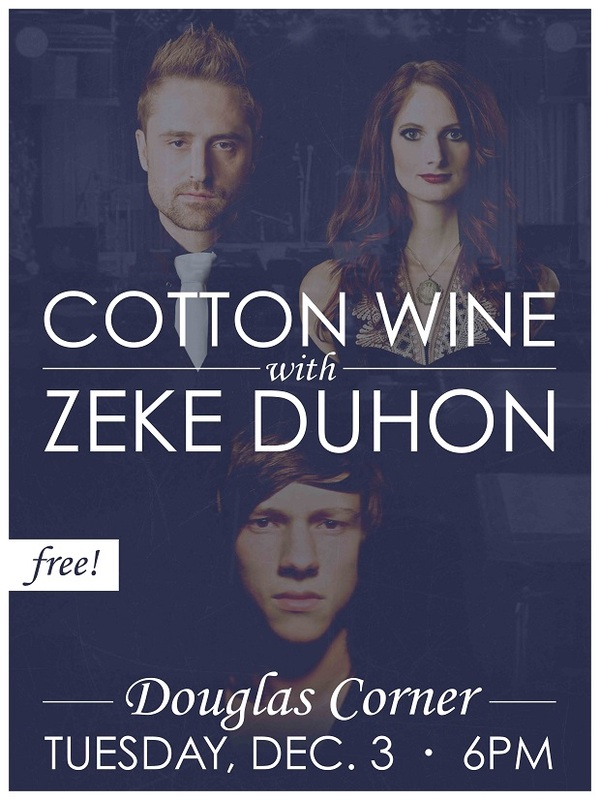 Cotton Wine and Zeke Duhon will perform tonight (12/3) at Douglas Corner. The show begins at 6pm, and it is FREE!